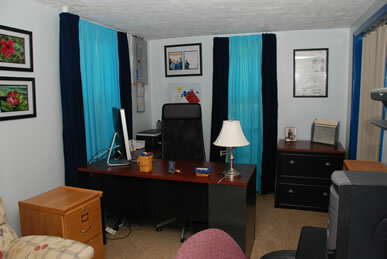 We have finally completed our basement makeover, and Catena Creations has a new office to show for it. The color scheme was based on the photo mural we hung up in April. Three shades of turquoise/blue were used on the walls, stairs and trim. Beige carpet became the “sand” for our beach. Seven samples of my photography from our Bahamas trip add color to the walls. My son and I now have a beautiful, tranquil space to share for work and play. He enjoys having a more masculine space for himself and his friends. The larger office space gives me more room to organize and keep track of client projects. USA Insulation, which injected liquid foam into the walls, inside and out, to keep the basement warm. The constant temperature of our basement went from 58-62 degrees to 70 degrees after they finished. They also insulated the garage ceiling, and our bedrooms were toasty over the winter. Murals Your Way for the photo mural and their attention to detail that made it turn out so well. Annadon Electric, which installed much-needed additional electrical outlets. Menard’s, where we got the paint, drywall, drywall mud, outlet covers, trim, windows, and countless other materials. Home Depot and Westlake Hardware also helped. Before and after photos can be found in my SmugMug gallery.